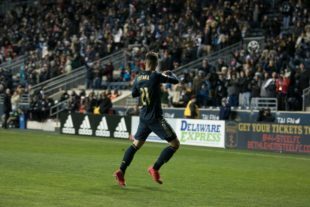 American Soccer Now caught a couple Union rumors in it’s own news roundup, including Fontana getting an Italian passport and Matt Real being a likely captain for the US U-20s. Head coach Jim Curtin’s midweek press conference came a day late, but included updates on Fabian Herbers. Also discussed was as Curtin’s opinion of McKenzie’s performance against the Red Bulls and the proposed changes to homegrown player rules. The CAA Women’s Soccer Championship tournament kicks off today, with Delaware facing Hofstra and Drexel playing the College of Charleston, both at one o’clock. Wayne Rooney could have lived the high life, but instead he chose to be part of the team when he joined DC United. It’s only nine minutes, but if you can’t spare the time the important thing from this soundbite is that Inter Miami plans to break ground for their new stadium in June or July 2019. Atlanta United president Darren Eales said €11 million for Miguel Almiron wouldn’t “get [him] out of bed”. But maybe €25 million from Tottenham could? Nico Lodeiro has been called up by Uruguay for their friendlies against Brazil and France. With the playoffs well beyond their reach, Sunday could be the last day for Bastian Schweinsteiger in Chicago. There’s still no coach, but the USMNT is out there recruiting dual-nationals anyway. The possibility of Gregg Berhalter as the next USMNT coach gets awfully complicated if his brother Jay Berhalter is appointed as US Soccer’s Secretary-General. A reminder for anyone playing the “best athletes” game. …except The Dynamo in Houston – that is. Now go out there this weekend and win one so we can all hang out with Phang one more time next week. They did beat the Dynamo in Houston the first time there this season. Fontana is savvy getting that passport. He can make a transfer to Europe MUCH more easily, and move from country to country without any fuss. That makes the Union’s value of him as a sell-able asset that much higher.